So you are having a Halloween birthday party and you need Halloween party ideas, don't worry you have come to the right place. We have lots of SPOOKY party ideas for your kids next birthday party. Halloween is the theme, but Halloween itself is a big theme. You can decide to have a Masquerade Halloween party or a Victorian Gothic Vampire theme party or maybe a Pumpkin-decorating party. All of these parties have Halloween as their main theme, but they focus also on a mini theme. For example you can't have a super scary Halloween party if your kid is very young, but if your kid is older in age you can make it the most scariest Halloween party ever. Have a look at our SPOOKY Halloween party ideas below, they will wow you off! We have easy and cheap Halloween party ideas for invitations, just look below. Fold a sheet of black construction paper, so it looks like an invitation card. Trace the shape of our Halloween Bat onto the black invitation card - as you would do with a valentine heart, trace down the half bat shape, cut it out. Glue a orange rectangular on top of the black invitation paper, to cover the hole. Open the bat and glue it on top of the orange paper, add green eyes to the bat. Voila you have a Halloween Bat Invitation. Same procedure as above but use orange construction paper- on top of that glue a black square. Trace the shape of a Pumpkin Face (easy to do) onto the orange invitation card. Cut and paint eyes nose etc. What ever invitation suggestion you pick remember to send them out early so everyone can get their costumes ready and encourage everyone to dress up! Join us to celebrate ___ 9th Spooky Halloween Birthday Party! RSVP to "name & phone nr" by "date". Costumes are very much encouraged! Do you need Halloween party ideas for costumes? Well, the best thing is to take your kid to a costume store and let her view some outfits to get an idea of what she want's. Then you can order A similar costume via the internet, as internet shops usually have cheaper prices. I promise you! In the shop you will get lots of costumes ideas and your kid can try it on. In Halloween there is no limit, your kid can dress up as what ever she want's as long as she puts a SCARY twist to it. Your little princess can be a witch - "Elvira" or "Morticia" from the Adams Family. Check out or SPOOKY Halloween party ideas for decorations. If your child is young don't put lots of SCARY decorations items all over the party room (house), it may scare your kid, and you don't want your kid to cry on her birthday, do you? Keep it simple, with lots of orange and black balloons, streamers and lots of Halloween images all over the party room. And of course don't forget to put lots of Halloween pumpkins all over the party room. But if the birthday kid is a bit older then look at our SCARY decorations below. Spooky Cobwebs, Gravestones, Spiders...: Put lots of spooky decorations such as gravestone, spiders, cobwebs and such. All over the party room. Spooky Spider Webs: Start by covering the inside and outside of your house with spider webs. Put them every were. Spooky Ghost: Make a ghost to make your house even more spooky. Use a white bed sheet, draw and paint eyes and mouth, make your ghost look spooky. Make the "HEAD" of the ghost: make a thin paste of flour and water, cut LOTS of long newspaper strips, blow up a balloon. Start by dipping the newspaper stripes into the glue and press them onto the balloon, one at a time. Do this 100 times over until you have a round ball, leave one end uncovered. Let it dry for more than 24 hours. Get a long wooden stick, pop the balloon inside the "Head" and place the wooden stick on the uncovered end. Seal the end with more newspapers stripes and let it dry again. The day of the party put the white sheet on top of the HEAD of the stick and place the spooky ghost were he can't fall, as many kids may try to touch him, when they see him. Monster Foot Prints: Draw and cut a large footprint-shaped hole out of construction paper. Paint it with a paint roller and red washable paint, and roll the footprints up your driveway and down your side path, leading up to the gates of the backyard. Giant Bats: Hang lots of big bats all over the party room and outside your house. Make these very large bats by cutting bats shapes out of cardboard. 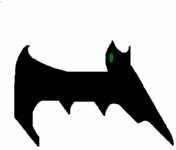 Use an overhead projector to draw them very large (copy a picture out of a book onto an overhead transparency) and then paint the bats with red or green eyes. If you have an outdoor party place the bats around the yard with wooden sticks. 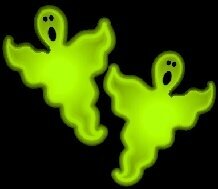 Spooky Glow: Give your house a spooky glow, use black lights instead of the normal light bulbs. Anything white will glow in the dark. Fountain of Blood: Via any party rental get a drink fountain (usually used at weddings). Get the biggest one you can get, have a fountain of blood, if you add a few chunks of dry ice in the fountain of blood = Spooky Fog. Spooky Mirrors: Get some few panes of glass and a few stripes of wood and make Spooky Mirrors, "mirrors that don't reflect". Place the mirrors in places were people will be looking at them. The kids will be really excited to realise they can't se their reflection. Candlelaaaabra: If the kids are old enough and your place is big enough, have a candlelaaaabra "lots of candles". It looks really nice, but this decoration is only for older responsible kids. Spooky Centrepiece & Tableware: Use orange and black table ware. If your child is young tie a bouquet of orange and black balloons to a pumpkin. Put other smaller (in various sizes) pumpkins next to the big one. If your kid is older have a Blood Fountain as centre piece (as described above). Add goblets, spiders, scattered candy corn down the centre of the table, also provide guests with pumpkin cookies with their names on, at each place setting. So you are looking for Halloween party ideas for games & activities. Don't worry we have a whole section just dedicated to Halloween party games for kids. Before you click away to our Halloween Party Games finish reading out Halloween party ideas. We have lots of fun Halloween party ideas below on cake, food and much more. But if you wan't to have a look at our games now, then click away. Also, don't forget to check out our fun Halloween Crafts there you will find lots of good ideas. Pick all or some of our yummy Halloween Party Ideas for food & drinks below. Spooky Sandwiches: Make Halloween sandwiches of your choice and then cut them into bat and ghost shapes using a Halloween cookie cutter. Fried Chicken & Blood Salad: Serve fried chicken with Russian salad. Make your Russian salad a bloody salad, colour the mayonnaise with red food colouring before mixing with the salad, this will make the mayo and the salad red. Halloween Tortilla Chips: With a Halloween shaped cookie cutter, cut each flour tortilla into bat and ghost shapes. Preheat a broiler, brush both sides of the tortillas with olive oil, broil, flipping once they begin to brown. Take the tortillas out and place them in a cookie sheet, lastly sprinkle with salt. Halloween Dipping Sauce: Make your dipping sauce as normal, but put the sauce in carve medium sized squashes or smaller pumpkins. Jack o Lantern Burgers: Carve faces into the cheese, make burgers as you would normally do, when done add the carve faces. Human Toes: Toes are made by cutting hot dogs into small pieces. Devil Eyes: Mix some mayonnaise with red food colouring. Make some hard cooked eggs, then when the eggs have cooled off, dip them into the red mayonnaise slightly. This will make the eggs red. Sparkle with some salt, finished. Human Ears: Human ears - dried apricots. Pumking Face Cupcakes: Make lots of cupcakes and decorate them to look like jack o lantern - with orange icing, use brown m&ms for eyes, mouth and nose (or use black icing). Jack-o-Cookies: Make cookies and frost them to look like jack o lantern - with orange icing, use brown m&ms for eyes, mouth and nose, (or use black icing). Bats & Ghost Cookies: With Halloween cookie cutters, in the form of bats and ghosts, make Halloween cookies. Frost the cookies with orange and black icing, be creative. Choclate & Strawberries: This is really yummy, and guests will really enjoy dipping their strawberries in chocolate. Pumking Punch: First make a punch bowl out of a large pumpkin (cut off the top, spoon out the meat). Fill the Pumpkin with vanilla ice cream and ginger ale. : Colour your drinks red with a bit of food colouring. Why not make a witch cake for your daughters birthday party. Please, no pumpkin cake, many children just want a normal cake like everyone else, they don't want a pumpkin cake every year. You will need an 8-inch round cake pan and a rectangular cake pan measuring 6 x 10 inches. Make the cakes (your own recipe). When the cakes are done wait for them to cool and then put them in the freezer for about 20-30 min (makes it easier to cut later). Make the paper pattern for your cakes, use the picture as a guide. Do first a template for the hat, then a round pattern for the face, then a pattern for the nose and the cheek. After that it's time to cut the cake. Now it's time to frost the cake. You will need green food colouring, (frosting for the face). Use chocolate frosting for the hat and add coffee or black food colouring to make it really black. Smooth the surfaces, so it looks really flat. Use the leftovers of the cake to make the hat brim, cover these with chocolate frosting too. Move the cake to a large tray (or were you want the cake to be presented). Now frost the remaining pieces and assemble all the pieces together- hat, face, nose, cheek, and the hat brim. 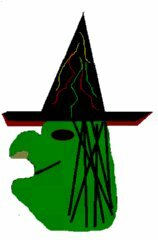 Use black spaghetti looking candy for hair and mouth, use brown m&ms for the eyes and use gummy worms to decorate the hat. We have awesome Halloween party ideas for Goody Bags, check out our ideas below. To make your own Halloween party bag, you will need A3 orange or black tissue paper, 1 Halloween sheet patterned gift wrap, A3 sheet of white paper, ½ metre orange or black ribbon, 2cm wide, 25cm black or orange ribbon 1cm wide, ruler and pencil, PVA glue and brush. 1. Brush glue on the white paper and stick the wrapping paper to it, then glue the tissue paper to the other side of the white paper. 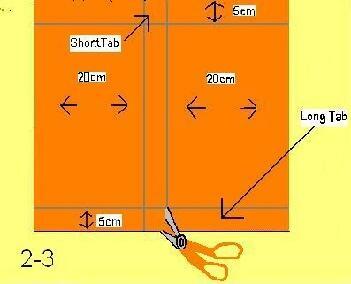 The sheet should be cut to 45 x 30cm. 2. Draw to lines, 5cm from the top and bottom of the sheet. Also, draw two lines 20cm in from the sides. Fold and unfold along the lines to make creases. 3. Cut where the lines cross, fold the two small tabs in. 4. Paste glue along the four long tabs, lift the paper so A and B meet. Press the long tabs together then take the small tabs (inside) and pull the small tags up, glue them to the sides. Now you will have a box shape. 5. Now make creases, so it looks like a bag. Make 3 hole on each side (on top of the bag). Thread the orange or black ribbon through the outside holes, to make handles. Tie a knot on the inside of the ribbon. 6. After you have put all your favors in the bag, thread a orange or black ribbon (the small ribbon) through the middle holes and tie it in a bow. Fill your party bag with small toys, bubbles, a colouring book, Halloween stickers, homemade orange play dough, glow sticks etc. Take lots and lots of pictures of each guest with your digital camera. After the party with the help of your computer put some Halloween border (bats, ghost, pumpkins, etc) around the pictures. Put a note at the end of the picture thanking guests for coming. Email the pictures to each guest (if the kids are to small email it to their parents). I hope you have enjoyed reading our Halloween party ideas and I hope the ideas will inspire you to plan a great Halloween birthday party for your little princess. If you have great Halloween party ideas (on costumes, invitations, decorations, cake, food, etc) you will like to share with us and others, please Submit It to us. It's nice when fellow parents share their party ideas and photos with us and other parents. This of course helps parents like you find FREE Halloween party ideas.